With so many skilled poker players around these days and chip stacks so deep, it's not at all uncommon to see a SCOOP final table stretch on for three, four, or sometimes even upward of five hours. Sometimes, though, a player comes in with a big stack, picks up a few big hands, and blitzes to a win before anybody knows what happened. dirty.brasil's run through the final of Event #43-L started off with more chips than the other players at the table and ended less than two hours later with a second career COOP title. The options for picking up more chips in Event #43-L, a $27 no-limit hold'em tournament, were the one re-buy available in the first two hours, the one add-on after that period, and the stacks in every other player's hands. The 2,877 starting players combined for 1,700 re-buys and 1,793 add-ons, building a $156,383.50 total prize pool shared between the top 360 players. The majority of those who cashed collected their payouts before play paused at the end of level 36 with dirty.brasil already holding a significant lead. At 9.13M chips, the player from Canada had 152 big blinds and 3.6M chips more than second-place pitaoufmg, a WCOOP 2012 and TCOOP 2013 finalist. Already a 2012 WCOOP champion, dirty.brasil's strategy for chasing down a second career COOP title involved adopting an aggressive posture from the start, seeking to jump further ahead and build a stack to bludgeon the table. It would take a while, but that strategy would pay off handsomely. But first past MicroMillions finalist swifterjet doubled through dirty.brasil, moving in early on with K♠ J♣ after the leader had opened for 512K on the button. dirty.brasil called but couldn't catch with Q♦ T♦, giving swifterjet the double to 4.5M, and an orbit later the two split a pot when both held A-K before the flop. In the end swifterjet would be the first to go, but not by dirty.brasil's hand. The Canadian player called all-in for 4.8M in the big blind with 9♣ 9♠ after kopakabritu had open-shoved in the big blind. The Brazilian looked to be in a pretty bad spot with T♥ 7♠, but the 5♣ A♦ T♣ T♦ 7♣ board delivered a tens full of sevens by the river, giving swifterjet a rough ride into 9th place ($1,329.25). That win had kopakabritu within three big blinds of the lead, and the Brazilian seized it on the next hand when GloRyKeepah's A♥ 8♥ held up to double through dirty.brasil's K♠ J♥. dirty.brasil moved right back in front on the next hand, though, after calling LameR25's 2.6M-chip open shove with A♠ K♦. LameR25, a WCOOP 2014 finalist who won the Sunday Warm-Up this January, was dominated with K♥ 9♥. 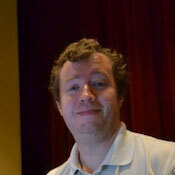 After the Q♥ 5♦ T♠ 5♥ 5♣ failed to bring help, LameR departed in 8th place ($2,267.56). That gave dirty.brasil 14.3M chips and the lead once again. Within an orbit the leader had already moved up to 18.8M, but the next knockout didn't come in that stretch. Instead it came after a pre-flop raising war ended up with Yuri "theNERDguy" Martins all-in, holding K♥ T♥ to pitaoufmg's 9♣ 9♥ and catching a ten on the turn to double to 11.7M. That left pitaoufmg with 391K, which all went in from the small blind on the next hand with J♦ 5♦ after kopakabritu raised in the cutoff with A♦ 7♥. Nothing resembling help came on the 4♣ 3♠ Q♦ A♠ 6♥ board and pitaoufmg was gone in 7th place ($3,831.39). Holding 12.4M chips and position on dirty.brasil, kopakabritu looked to press the advantage two hands later when both players were in the blinds, moving all-in with 3♣ 3♦ after dirty.brasil limped from the small blind. dirty.brasil called with A♣ Q♠ and 6.7M behind, but the buffer proved unnecessary. The river card of the 9♠ 4♦ 4♥ 6♥ 9♥ board negated kopakabritu's treys and made nines and fours for both players. kopakabritu played the board for the 6♥ kicker, though, and dirty.brasil's A♣ kicker ended up being the difference in the 25M-chip pot. With that, kopakabritu exited in 6th place ($5,395.23). dirty.brasil took a stab at another knockout on the next hand, raising on the button with K♥ Q♠ and calling when GloRyKeepah moved in for 5.5M in the big blind, but GloRyKeepah's A♥ 7♠ caught aces on the flop and river for three of a kind to stay alive. Seven hands after that dirty.brasil opened all-in with 5♦ 5♥ and the only caller was past Sunday Million finalist rodloiola, who had T♣ T♠ in the small blind. rodloiola was drawing to two outs after the A♣ 9♣ 5♠ flop but the A♠ turn and 4♥ river didn't deliver, sending the last of the final table's three Brazilian players to the rail in 5th place ($6,959.06). theNERDguy was the only player remotely close to dirty.brasil now at 15.9M chips. But then the WCOOP 2015 PLO/8 champion and WCOOP 2014 Main Event runner-up dropped 7M to the leader a few hands later. After checking the K♥ 7♦ 9♥ flop and then semi-bluffing the turn and river with 8♦ 6♦, theNERDguy watched dirty.brasil show down J♣ J♠ and drag the 14.3M-chip pot. With 36.5M chips in hand, dirty.brasil now had 19 big blinds more than the rest of the table combined and used that advantage to apply consistent pressure to the others, who were looking at a difference of more than $4,000 between being the next player steamrolled by the leader and hanging on one more spot. With 10 minutes that stack was up over 50M, thanks to another knockout. Already in for 600K in the big blind, GloRyKeepah called with A♠ 3♠ after dirty.brasil shoved in the small blind. That was a 2-to-1 favorite over 9♣ 2♦, but the turn of the K♠ 7♣ 5♥ 9♦ 4♦ board made a pair of nines for dirty.brasil, sending GloRyKeepah to the rail in 4th place ($9,148.43). Another 10 minutes later the leader picked up T♣ T♠ in the big blind and called when BioNicle9 moved in for 6.8M. The German player had K♠ Q♠ and missed the 3♦ A♦ J♣ 6♠ 7♥ board completely, bowing out in 3rd place ($13,292.59). theNERDguy was facing a massive uphill battle and did so with a sense of humor. Even after doubling up twice, theNERDguy was still facing a 3-to-1 chip deficit and had to stay extremely aggressive. That led to three-betting all-in with Q♠ 8♠ on the final hand after dirty.brasil opened on the button, and dirty.brasil made the call with A♣ 9♦. The turn looked like it would extend the match, but the river of the K♠ 6♥ 5♦ Q♥ A♥ board made dirty.brasil a pair of aces and closed the tournament out. Yuri "theNERDguy" Martins fared well, weathering the storm to second place for $18,558.02. As for dirty.brasil, the win marked a second career COOP title after a four-year gap, and it came with $24,710.41 and a fancy SCOOP champion's watch. Congratulations to both players for making so much out of a $27 tournament!